I have had a varied career in theatre, having worked as an actress, singer, writer, director, theatre designer, visual and performance artist. Recently furthering my academic study working towards an MA(ed) in three stages. I have now completed two of these and have just received a ‘Distinction’ for my Dip(ed) Research project. This was on how instinctive ‘movement’ and theatrical approaches to text could possibly benefit learning, memory and empathy, especially in regards to understanding, narrative and the enjoyment of reading and language. This research is aimed at improving the learning abilities of those with Dyslexia, Dyspraxia and on the Autistic Spectrum, although it could be far reaching and help all. I have become interested in how culture plays an important role in social behaviour and brain development – theatre, visual arts, and storytelling are good for your health. I would love this to eventually lead to a PhD and published work- here’s hoping. My first professional performances were with my family, at the age of thirteen, touring with ‘THE PALM COURT THEATRE ORCHESTRA AND COMPANY’ http://www.youtube.com/watch?v=fe6VG1irsg0. I come from a long line of theatre performers and music hall artists going back to the mid C19th. I have been making puppets, masks and inventing stories to perform since childhood. Firstly I trained in Expressive Arts at Brighton Polytechnic. This was a combination of visual arts and theatre studies leading to a BA (Hons) Degree. Brighton was an exciting place, with the arts at its very heart. There were performance happenings manifesting regularly in the middle of the streets, exhibitions and ground breaking theatre that inspired me as a young artist. Here I started a small street theatre troupe called ‘PAROMYME’. I toured an enigmatic masked character called ‘What is Henry?’ and was booked by Todd Cody’s Circus for children’s entertainment days, including on The Ark Royal and for Tetley Tea. This was also at the height of my parents company’s popularity and they would often have three show touring at once. I would work regularly for them for extravagant corporate entertainments for companies such as Citi-bank or touring to regional theatre’s up and down the nation. I was asked to write, direct and perform murder mysteries acting alongside TV stars, wrote and performed a one woman show for a Barbican Foyer Entertainment, danced as a pierrot, and moved as a robot, performed as improvised characters and also made costumes, table settings, party masks and stage settings. After a year out following my degree, spent working in London as a Stage Manager for fringe theatres, I gained a place at Cygnet Training Theatre, Exeter, to study Acting. An extraordinary drama school with links to Peter Brook and Influences from Growtowski. Cygnet was ground breaking, producing exciting seasons of plays and I am very glad I went there. It was usual to be in several plays at the same time, touring in the South West including The Minack open air theatre in Cornwall and Plymouth Theatre Royal, Drum. In my first year I not only toured to Germany as Jenny Diver in John Gays ‘Beggars Opera’ but also played Alice in ‘Alice in Wonderland’ touring to schools. I had a ball doing what I loved to do. I finished three years later after a successful Edinburgh Festival as Perdita in ‘A Winters tale’, waved good buy to my fellow student friends and set out as a professional actress. The big thing then was to get the prized provisional Equity Card, then work up to a full card after several weeks of professional work. The famous ‘Catch 22’ you couldn’t work unless you had a card and you got your card by working. I managed to get mine through a long summer season with a small theatre company based within Pleasurewood HillsTheme Park. I fronted and sang in two shows, ‘Woody’s Birthday’ and ‘Professor Twit in search of the lost Dinosaurs’, I worked several puppets including pterodactyls and dressed up as the park Costume Characters and entertained the crowds. Towards the end of the season the park was open at the weekends only, so during the week I toured nationally in ‘Metamorphosis’ as Mrs Samsa. The following season I changed theme parks and went to work at AltonTowers. I fronted a music show and played Mrs Tiggywinkle in ‘Peter Rabbit and Friends’ on ice, directed by Richard Gill, founder of Parasol Theatre Company. I became quite notorious as that hedgehog and am still known as Mrs Tiggywinkle by friends on Facebook.Mrs Tiggywinkle. I met my husband who was my follow spot for the ice show during my second season at the park. Eventually I was able to use my classical theatre skills during a repertory season for The Century Theatre in Keswick. I played Louise in ‘Private Lives’ and Helene/Nursemaid in ‘The Dolls House’, directed by The Royal Shakespeare Companies’ associate director Gregory Doran and was able to gain my full Equity card. After this I acted in small scale runs such as ‘Murder in Cathedral’ at the Oundle Festival and in a Theatre-in-Education tour for Bitesize Theatre Company, also running an art gallery within The Brewhouse Theatre,Taunton, where my husband worked. I was asked to co–produce a millennium project for Cannock Chase Mining museum with Illyria Theatre Company. I felt this was a good opportunity to launch my own company, run with my husband, called ‘Whirlwind Theatre for Children’ www.whirlwindtheatre.org.uk. I directed sixty children, researched and wrote the script and commissioned music to be especially composed. The play did more than entertain, it brought together disparate groups of people divided since the nineteen eighty’s miner’s strikes. Not only was this project a success but also put the foundations in place for the inclusive ethos of Whirlwind Theatre for Children. 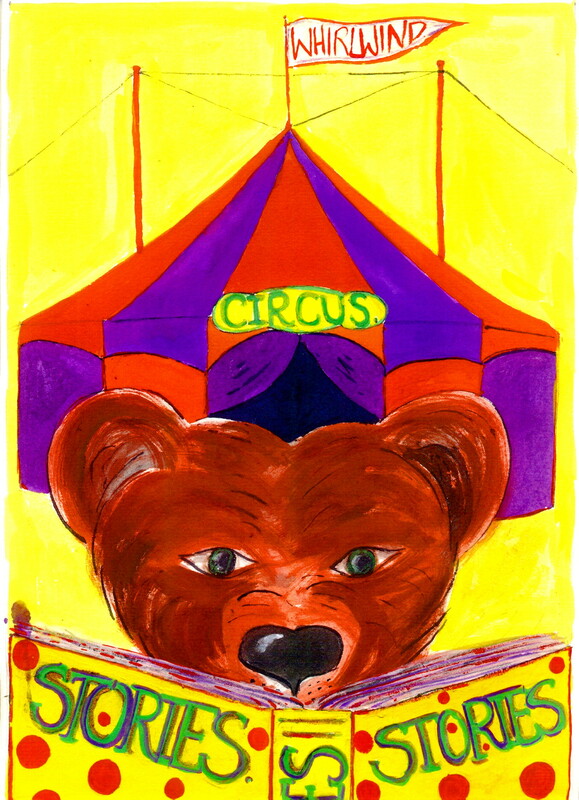 The first Whirlwind Theatre tour was ‘Goldilocks and the Three Bears’, written by myself, directed by Alistair Ganley, artistic director of Cygnet, and choreographed by Simon Selmon of The London Swing Dance Society. The crits were very good, however the tour was cut short because of the birth of Errin, my first born daughter. David Wood, OBE, became our Patron, who I had met whilst working at The Brewhouse Theatre. We moved Whirlwind to Lancaster in 2002, heavily pregnant at the time with my second child Aedan, to be based at The King’s Community Church and remained there for seven years. We ran summer school productions with a cast of professionals and many local children and local school projects, these included: ‘Toad of Toad Hall 2003, Kings New Clothes 2003, Hamish Bear and the Storytelling magpie 2004, ‘Light House Keepers Lunch 2005, ‘The Selfish Giant’ 2006, ‘Around The Pond in 80 Days’ 2007 and ‘Brilliant the Dinosaur’ 2008. In 2009 the church underwent major refurbishments and we transferred to The Storey Creative Industries Centre and are now based at The Gregson’s centre. We started a regular Inclusive Youth Theatre, on a Saturday morning which incorporates technical theatre as well as performance and we have young people between five and sixteen years attending regularly. So far the youth theatre has produced ‘The Lion, The Witch and The Wardrobe’ which featured my designs and Masks. These took an incredibly long time to create and all the Elizabethan costumes were traditionally laced and structured. The company is now working towards an exciting version of ‘The Tempest’ using life size puppets for all the older characters. It is through Whirlwind Theatre, as professional development, that I undertook my MA (ed) in Inclusive Theatre. This is a programme of study with Chicken Shed Theatre and Middlesex University. As a visual artist, as well as an actor/director, the design elements are very important to me and to the work of Whirlwind Theatre. I am now branching out on my own producing my masks, puppets and one woman shows for children. This is in development and I am applying for funding through the arts council. I will keep you updated through BLOG feeds and FACEBOOK. I am really excited as this is mixing both my visual arts, performance and writing skills. I hope you will all keep looking at the progress of this and come to the eventual tour. I have also been writing and performing bespoke stories for a mums and toddlers group called ‘Grown up’s and Growing Ups’, lead storytelling workshops at The Duke’s Theatre for Lancaster Children’s Film Festival. You will also find on this website Children’s Drama parties that you can book and I will be happy to entertain. Well that is my story up until now and who knows what will come next. I hope you enjoy my web site and all the photo’s. 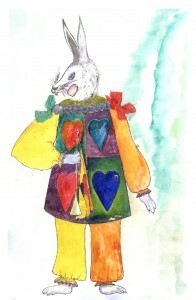 The Watercolour drawings included are also by me and are from posters, publicity and costume designs for various shows.